My name is Sue. I live in the N. E. part of Illinois. I am inquiring, if by chance, you might know who I can contact for Rose Hill Cemetery in Albion, Noble County, Indiana. I am researching my Reynolds line in Indiana. While researching my gggrandmother, Anna Reynolds Thomas, I came across a 2012 edition of The Indiana Genealogist which featured an article on The Mysterious Milton Reynolds. I thought I would pass this along in case you had not found this Milton. Henry and Jefferson Counties are not very far from one another. I have a copy of the U.S. Headstone Applications for Military Veterans, 1925-1963 showing William Osborn who served in the Revolutionary War, died 5 Apr 1835, and was buried on a farm in Boonville, Indiana. A Mrs. Forsythe of Newburgh, Indiana applied for a military marker on 30 July 1935. Would you have any records on where William Osborn was buried in the area. I would like to see his grave when I am back in the area, I grew up in Hoopeston, Illinois and have been researching my father's side - Etherton. Thank you for any information you may have. I did check the list of Revolutionary War Veterans who are buried in the state of Indiana compiled by the Inidana Society NSDAR and did not find him there. 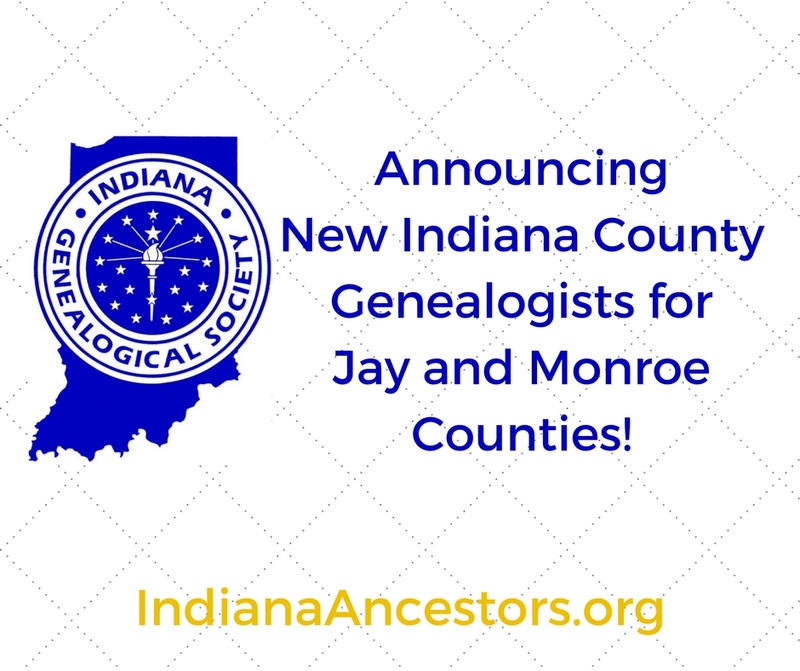 The Indiana Genealogical Society is pleased to announce two new Indiana County Genealogists: Megan MacDonald for Monroe County and Janice Stucky for Jay County. Megan MacDonald is the research Librarian at the Monroe County History Center's Genealogy Library and has lived in Monroe County for 12 years. She has worked for the Indiana University Archives and Libraries where she became well-versed with the families associated with Indiana University and Bloomington. Megan is also a part of the African American Committee, and works with the county for the Bicentennial, researching the early African American families and their contribution to Monroe County. Contact information for Megan MacDonald is 922 W. Howe, Bloomington, IN 47403; e-mail memeacdon@gmail.com. Janice Stucky has lived in Jay county all her life and has been the librarian at the Jay County Historical Society since 2003. She helped to write the textbook that third-graders use to do their history projects. Janice has also compiled two books of materials from information found in the Dunkirk and Pennville libraries. Janice can be contacted through the Jay County Historical Society, 903 E. Main Street, Portland, IN 47371; phone (260) 726-7168 or by e-mail at research@jaycountyhistory.org. Indiana County Genealogists (ICGs) coordinate Indiana Genealogical Society’s genealogical information and activities in their county, working with the local genealogical and historical societies, as well as other genealogical organizations, individuals, and repositories. They serve as the contact person for in- and out-of-state researcher members as well as non-members, to help them accomplish their research goals in their county. You can find a list of all Indiana County Genealogists and their contact information on the IGS website. 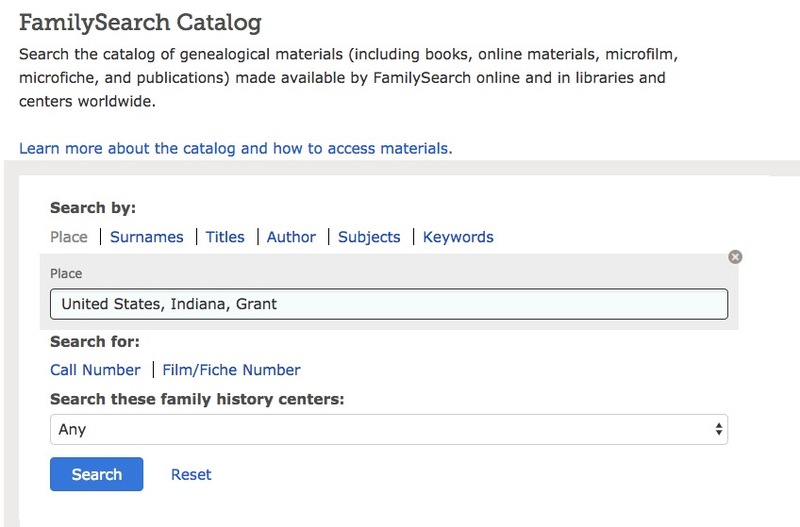 There are more than 3 million records in FamilySearch's collection "Indiana Marriages, 1811-2007" (and IGS is proud to be involved with indexing that collection!) But did you know that not every county is included in that collection yet? What's more, that collection doesn't even have all of the marriage records that FamilySearch has digitized! Here's how to find more. 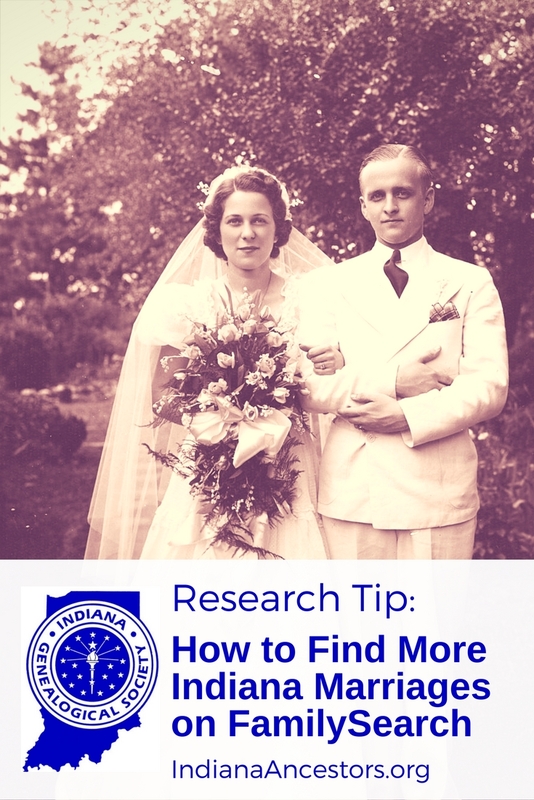 The "Indiana Marriages, 1811-2007" collection is available through the Historical Records section on FamilySearch. (Hover over the Search tab, then click on Records. You'll find a link to "Browse all published collections.") When you get into the collection, you can click "Browse through images," which will give you a list of the counties that are included. As of October 2017, it includes 70 of Indiana's 92 counties. Marriage records, Circuit Court, Grant County, Indiana, 1831-1955. When you click on a title, you'll see its availability. 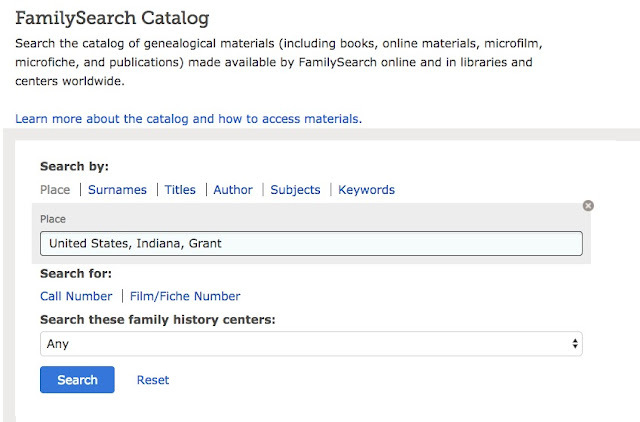 The camera icon with the key over it means that these records have been digitized, but can only be viewed from a Family History Center or from a FamilySearch affiliate library. Family History Centers are free to use, but sometimes have limited hours. If your local Center isn't open when you're available to do research, check to see if your local public library is an affiliate.